California Street is over 5 miles long and one of the longest streets in San Francisco. It has a number of important landmarks including the Fairmont Hotel, Mark Hopkins Hotel and Ritz Carlton. 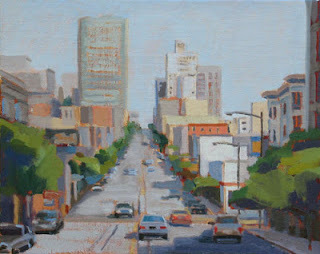 The view in my painting is the eastern portion of California Street which runs from Market to Van Ness Avenue. You can see Polk Street in the foreground and the cable car lines in the street. 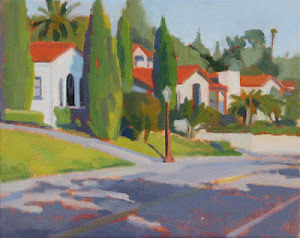 You may have noticed that I like to paint streetscapes. It makes for challenging compositions. Part of the challenge is deciding what architectural elements to paint and what to leave out. Simplifying the color palette brings harmony to a city scene that can be full of bright garish colors on signs, buildings and cars.